World music from Mongolia will be presented on Friday, April 5 at 7:30 p.m. at the Weis Center for the Performing Arts. A pre-performance talk with the artists will take place on the same day as the performance at 12 noon in the Atrium. Anda Union, a Mongolian phrase meaning “brotherhood of friends”, is a nine-member ensemble hailing from differing ethnic nomadic groups that unites tribal and music traditions from all over Inner Mongolia. 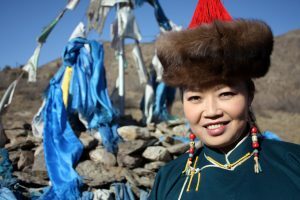 As with all nomads, the Mongols have an oral culture, passed on generation to generation in stories, music and songs, and thus, Anda Union sing its history. The band’s thoroughly addictive combination of Mongolian musical styles is a reflection of the performers’ roots and combines a wide range of musical instruments and vocal styles. The group have influenced a generation of young Mongolians as traditional music flourishes. Keenly aware of the threat to the Grasslands and their age-old Mongolian culture, Anda Union fights for the survival of this endangered way of life by keeping the essence of its music alive. Each member has been trained in traditional Mongolian folk music from a young age, including the two-stringed morin huur. As a group, they hold on to the essence of Mongolian music while creating a unique sound that The Guardian calls “glorious evocations of the Mongolian steppe”. The morin huur, or the Mongolian “horse-head fiddle,” figures prominently in the music of Anda Union. In the piece “Galloping Horses” the musicians from Anda Union playing this instrument showcase its energetic, rhythmic quality and its capacity to imitate horse sounds. At the same time, the morin huur is known for its ability to express mournful feelings of longing and loss, which is not surprising if you consider that common lore recounts how a boy made the first morin huur from the remains of his beloved, unjustly slain horse.